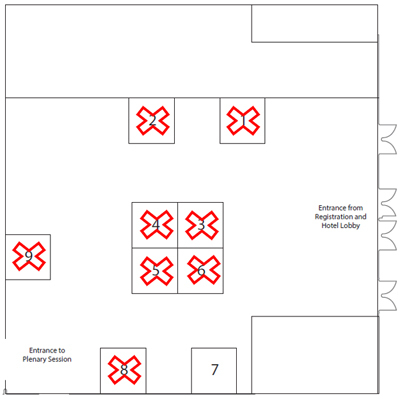 Space includes: booth space (8′ deep x 10′ wide) with side and back drape, (1) 6′ x 3′ skirted table, (2) chairs, (1) wastebasket & ID sign. Exhibitors receive one (1) complimentary all-access badge to attend the educational sessions, one (1) exhibit hall only badge, post-conference attendee list with physical mailing addresses for a one-time mailing and a company listing on the Sponsors & Exhibitors webpage. Click here for the Online Exhibitor Kit. Click here for Power and Internet Order Form. *For setup Tuesday morning, please contact the exhibit office. 7:00 a.m. – 6:45 p.m. Morning Break: 10:30 a.m. – 11:00 a.m.
Networking Luncheon: 12:30 p.m. – 1:15 p.m. Transition Break: 2:30 p.m. – 2:45 p.m. Transition Break: 3:45 p.m. – 4:00 p.m. Transition Break: 5:00 p.m. – 5:15 p.m.
Networking Reception: 5:45 p.m. – 6:45 p.m. Morning Break: 10:00 a.m. – 10:15 a.m.